The stage was set to the front of the Fuqua conservatory, where a small lily pond separates the band from the lawn. Doors opened at 7:00, and we (two friends from work and one's fiance) arrived around 7:45 with blankets at the ready. Given the ease of entry at the gate, it was somewhat startling to see the lawn mostly full, and certainly full to the point where seeing any facial expressions of the band was impossible. Before getting to the band, there were several observations worth mentioning. First, the lawn area is flat. I hadn’t really thought about the absence of an inclined amphitheater type setting during my previous visit, so to some extent, the selection of the Garden for hosting concerts seemed a bit forced. It was difficult to find a comfortable posture due to wrists which tired of supporting various body positions to see over those seated in the lawn chairs. I know, an old man’s gripe. Secondly, by and large, the crowd mostly remained seated. I'm sure there are other artists whose music pulls people out of their seats, but this was primarily an audience prepared to listen. Seated audiences are a rare thing; I attribute it to many of the attendees being supporting members of the Garden, meaning mid-50’s or older and not particularly energetic concert goers. The Garden is also quite the vendor for alcoholic beverages. Who knew? Sweetwater 420 bottled beers were $6 and wine bottles were $16, all served in plastic tubs with ice with a friendly reminder to use the recycle bins placed around the lawn. Perhaps not so much a surprise were the fairly numerous, largely female, attendees who gave Lucinda a couple of songs to see what she was about, then gathered around their blankets and chatted amongst each other, loudly. But no so much in our area, as a curly white haired man took it upon himself not only to make aggravated faces, but to approach them and tell them to "Shut up!" Useful, he was. 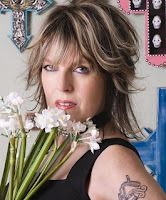 Lucinda Williams is an acquired taste, due largely to an accent that leans to the redneck side of “Southern.” She can write startling emotional lyrics, usually in the third person in wonderful narratives. When she moves to the second person, it generally means that men should run for cover. It won’t speak well of them, but it makes for a good listen. Of all the venues to which I’ve been, the Garden had the most amazing acoustics. Every inflection of every word could be heard, which is both welcome and necessary to fully enjoy Williams’ songs. At the end of every concert, one hopes to have discovered something about the artist that they didn’t know before. Lucinda, it is fairly well known, is a perfectionist. The sheer number of songs that speak of past lovers suggests that this likely contributes to her presumed problems with men, no matter how she derides the men of her life. In concert, her perfectionist requirements were abundantly clear, as she complained from the heat from the stage lighting. It was a typical July evening in Atlanta, and there was not a hint of a breeze. That said, she’s from Louisiana, where I’m certain she’s heard of a fan. She was quite fussy about the lighting, to the point of expletives, and the audience could hear every word of her discontent. Still, the passion which turns her pronunciation of “heat lamp” seemingly into a cuss word is the same passion that drives much of her music. Despite perfectly fine performances under the accursed heat, she continued to apologize throughout the night. The fix for this outing was a blue stage light, the color of which was appropriate for much of her work. The band was awesome, particularly guitarist Doug Pettibone, who was given ample room to roam. The highlight for me was “Come On,” which improved upon her recent album version and which makes “You’re So Vain” seem a love song in comparison. I’d hate to be the guy she was singing about. Her song selection was a bit uneven. New songs planned for an October release were promising, but most in the audience probably had a favorite or two that was left out. The song I most wanted to hear, and didn’t, was “Side of the Road,” a very smart song about searching for a measure of freedom while within a committed relationship. In any case, it was a great evening, and a great venue. Next time… lawn chairs!